The decisions you make each day to buy, prepare, and eat your food, go beyond just satisfying your appetite. They affect how well and how long and how happy you live. Your health is greatly influenced by the interactions of the nutrient value of what you eat and your genes. The evidence is overwhelmingly clear that whole, real, and nutritious food will enhance the action of protective genes, while foods of poor nutrient (toxic) value will suppress them, leading to greater risk of developing many of the chronic diseases we are experiencing today. We all know we are supposed to eat our fruits and veggies. But really, WHY? Because they contain the most protective substances (phytochemicals, flavonoids and antioxidants) that ward off free radicals that cause oxidative stress and chronic inflammation which damage all our cells, and thus reduce our lifespan! Fruits & Vegetables are rich in fiber, contain no cholesterol, and are naturally low in fat and calories. 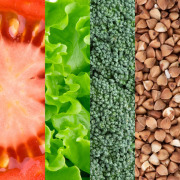 They are the key sources of essential vitamins, minerals, and antioxidants including: folate, beta carotene, potassium, magnesium, and selenium, Vitamin C , lutein, and zeaxanthin. These protective vitamins and minerals guard against age related diseases like macular degeneration and osteoporosis. Eating an abundance fruits and veggies have been shown to lower blood cholesterol, regulate blood sugars, reduce body fat, & reduce the risk of heart disease and cancer. You WANT your future to be purposeful, joyful, and vibrant! You need a healthy body to achieve that! The quality of your life depends on the choices you make today. Choose to EAT well and LIVE well!